There are many golf books out there offering a horde of advice and teachings to help improve your entire game, swing, putting etc. Here are our top five best golf instruction books of all time. It was Ben Hogan’s belief that any golfer, no matter their level of skill, can improve their game considerably by merely learning and implementing a few basic motions correctly and in sequence. His five lessons cover such areas as “The Grip”, “Stance and Posture”, “The Backswing” and “The Downswing”. His fundamentals were first published as a series of articles in Sports Illustrated in ’57 before being published as one of the best golf instruction books of all time. The Modern Fundamentals of Golf teaches players the very basic ingredients of playing golf and playing it well no matter the level they are at. 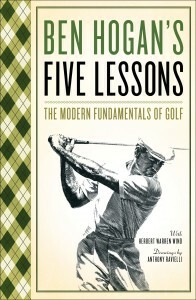 Buy Ben Hogan’s Five Lessons here! At the young age of eight, Harvey Penick became a caddie in Austin Texas, starting what would be a very long and successful golf career. He later became the head golf coach at the University of Austin. 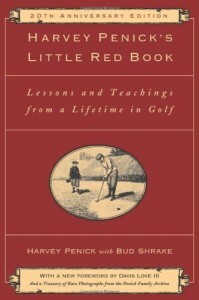 His Little Red Book, was published in 1992 and takes its name from the red notebook Penick always carried with him on the course. Penick focuses on the mental aspect of the game and his advice can often be applied just as easily to life as to golf. He advocates absolute focus, clear mindedness and “taking dead aim”. This book is great place to start for beginners and also an invaluable resource for pros finding themselves in need of some inspiration and mental focus. This is the book that introduced Ernie Els to the game of golf. Originally published in the ‘70s, it has been updated with a new introduction, closing and new illustrations. Jack Nicklaus’s techniques and mental game changed over the years and those insights are now shared in additional chapters. Jack also shares his insights into how professional golf has changed since he joined the PGA Tour in 1962. Nicklaus describes in detail his thought process and swing technique for every shot on the course. He shares his warm up routine and how he mentally prepares himself for the game. His playing style may not suit you in every way since we all have our own style, but you will come away with insights and teachings that will greatly improve your game if applied. Along with the two books above this is one of the best golf instruction books ever published and this revised edition simply adds to that accolade. 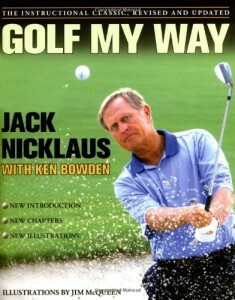 Buy Jack Nicklaus’ Golf My Way here! Considered one of the top sports performance consultants in the ‘90s, Bob Rotella worked with players such as Nick Price, Tom Kite, Davis Love III, Prat Bradley, Brad Faxon, John Daly and many others. In his book Golf is Not a Game of Perfect, he addresses the mental preparation needed for the game and also how to maintain that positive, focused mental state throughout the tournament. It’s all put into context in the chapters where he shares and reminisces about how the pros he works with puts into practice his techniques. He is famously quoted as saying, “The best swing thought is no swing thought”. By learning to not overthink your swing and shots, you are bound to play more naturally and enjoy the game far more. This book is essential reading if you want to improve your mental approach to the game. 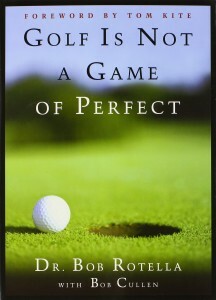 Buy the Golf is Not a Game of Perfect book here! This book has a more focused angle: short game. As any golfer know, the majority of the strokes you lose are 100 yards or less from the green. The key to improving your scores and lowering your handicap is in the short game. It also happens to be the part of the game that people focus on the least — most people practice too much on drives, and mid-long irons. Dave Pelz has golf schools that only focus on short game and putting. He has taught players like Colin Montgomerie, Lee Janzen, Vijay Singh, Payne Stewart, Peter Jacobsen, as well as LPGA players like Annika Sorenstam. In his book, Dave explains his system and techniques, including a number of unique tests and exercises for mastering your short game. 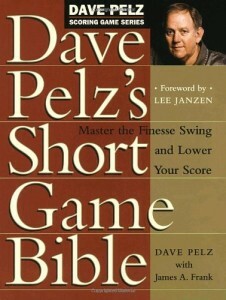 Buy Dave Pelz’s Short Game Bible here! Whether you are looking to improve the mental side of your game or want to focus on more technical aspects there is a book in our selection of the five best golf instruction books of all time that will help you. With such timeless and valuable advice shared on those pages, perhaps it will be wise to add more than one to your library. If you find that watching videos is more your thing, check out Adam Young’s Strike Plan. It is a 17 video series that covers everything you need to know from the mental preparation down to the physical motion of a proper golf swing. 1 Pings/Trackbacks for "The 5 Best Golf Instruction Books"